- Full services for all artists needs. - Perfect for artists looking to reproduce their artwork on a variety of media. 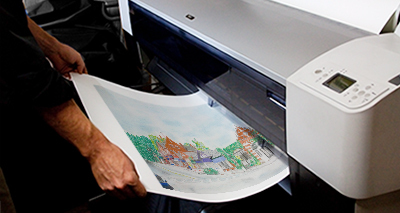 - We digitize your artwork using high-resolution scans and photography. - Scanned images can be sized for optimal web or print needs. - Archival giclée printing on over 20 types of papers and canvas. - We can design and print catalogs, brochures, business cards, postcards and tear sheets for you. - We print artwork on a variety of gift products to offer artists more re-sale opportunities. Frame It does not reproduce artwork or other copyright-protected media for anyone other than its creator or authorized representative, in accordance with U.S. Copyright Law.